DOS Mega Man (USA) in 02:23.55 by DarkKobold. 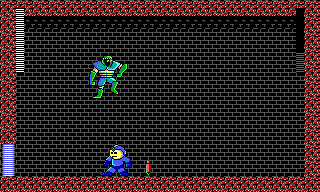 This is a Mega Man game that was not developed by Capcom, but rather by Stephen Rozner of Hi-Tech Expressions, who did all the design, programming, graphics and sound. The game is infamous for its mediocre quality. In this run, DarkKobold uses precise movements and the absence of boss invulnerability periods to complete the game in under two and a half minutes. This game runs too fast on anything more modern than a low-end 386 or so. As such, the encode is technically correct. For an encode that is slowed down to the original 30 fps, see this YouTube video.